Baby Things I Want: Doubles and Triples and Quads... oh my! Doubles and Triples and Quads... oh my! When you are shopping for a stroller for your first child, the selection is, quite frankly, dizzying. If #2 arrives when #1 is still small and you need a double stroller, you will likely find something you like from the many options out there. 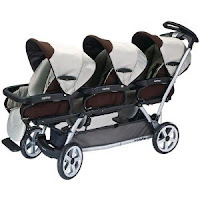 If #3 comes soon afterwards and you need a triple stroller, the selection is quite dismal. It's almost enough to convince me to let my almost-3-year-old stand on the sidewalk crying because he doesn't want to walk to nursery school...but not quite. The best triple stroller advice is to avoid buying one in the first place. One option is babywearing the new baby (while pushing a double stroller) until the oldest walks independently. Imagine the upper-body strength you will gain as you push two toddlers in a double stroller with a child strapped to your body! I've tried this and it's alright for short distances, but not for longer trips. 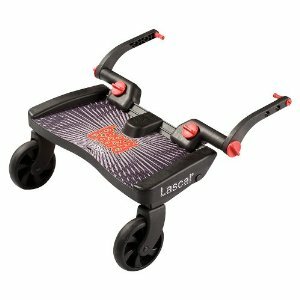 Another plan may be to attach a buggy board to your double. They are inexpensive and easy to use...if your toddler will consent to standing on one while his siblings sit. 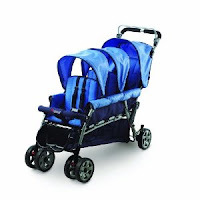 A double sit-and-stand stroller (like the Joovy Big Caboose) is another option. It is only marginally larger and bulkier than a standard double stroller and is a good choice if your oldest doesn't protest sitting/standing on the platform. You can also find double strollers which accommodate an extra seat in front (like the toddler seat snapped onto the Valco Trimode EX Twin) or on top (Triple ABC Adventure Buggy Pram from Adventure Buggy Company). When the oldest no longer needs the third seat, you can detach it and you'll have a useable double stroller for the younger ones and you won't feel so guilty about spending so much for either of these, which are nice, but pricey. 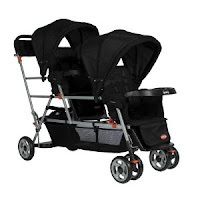 Standard triple strollers basically come in two configurations: much too wide and much too long. 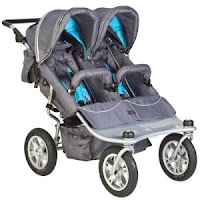 I can't imagine anyone doing any actual jogging with 3 kids, but the Baby Jogger Summit XC Triple looks rugged and sturdy and able to navigate through rough terrain. For ease of transport, the Obaby Triple Pushchair is an umbrella-style stroller that looks sleek and compact and folds to quite a small size. I would find it difficult to maneuver through doorways and supermarket aisles with something so wide and would likely only use it for... well... strolling around. uneven sidewalks and curbs. The Triplette is a triple version of my beloved Peg Perego Duette double stroller, which has withstood a lot of my abuse. Not surprisingly, the Triplette is expensive while the Trio is affordable-ish. ("Getting ready for #4 already?") or pregnancy rumors. 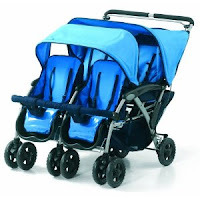 In a category of their own is the Runabout family of strollers. These are seriously masterpieces of engineering and design...they look like something out of a sci-fi film. They are not cheap, but they are hand-made and extensively tested...and meant to last 20 years. Their sales pitch makes sense to me -- why keep replacing strollers when you can buy one practically indestructible one that expands to fit up to 6 kids? As needed, additional seats can be attached onto the frame. I could not conceive (pun intended!) of a more practical stroller than this for a growing family. And yes, it also answers the 'double, triple or quad?' debate. Chava Kovacs is a cat person. Her hobbies include vegetarian cooking and eating vegetarian foods. She does e-commerce part time. She loves coffee and is mom to 3 children under the age of 3... these last two pieces of information are unrelated.